The Oystercatchers are a small family of shorebirds that have specialized bills for dealing with oysters, mussels, and limpets. There is a black or pied species -- and sometimes both -- on most shorelines (particularly rocky ones) at temperate latitudes around the world. Where I live on the Monterey Peninsula, California, the Black Oystercatcher (left in the large photo by Ronald L. Branson) is conspicuous by its loud cries, particularly in the spring when pairs chase each other about (inset flight shot) and then land, bowing to each other in courtship. Because habitat is so narrow and so limited, few pairs can inhabit the same stretch of coastline. An interesting situation developed off western Baja California, Mexico, where collectors in the late 1800s removed most of the oystercatcher populations (both Black & American oystercatchers occurred there without apparent interbreeding). With the tideline niche now open, immigrants from the north (Black Oystercatchers) and the southern (American Oystercatchers of the race frazari) begin filling the habitat. With much less choice in mate selection under these circumstances, significant hybridization between the species occurred, and the zone is still not entirely settled (Jehl 1985). Accordingly, vagrant American Oystercatchers in coastal southern California to this day are scrutinized using the "Jehl index" -- a scoring system of ten characters (wingstripe, rump pattern, etc.) -- that separates normal variation from apparent introgression (see Roberson 1993 for application of this index to particular records). In contrast to the narrow niche of the black oystercatchers, various pied species are more catholic in habitat choice. The American Oystercatcher (two birds at left in a fine photo by Jeri M. Langham) does frequent rocky shores in western Mexico, but on the Gulf Coast is equally at home on mudflats (it also ranges down both coasts of South America). Some wandering occurs in these black-and-white species as northern populations withdraw in winter. These particular American Oystercatchers in the photo were spectacular vagrants to the Salton Sea: three were discovered at Salton City, Imperial Co., California, on 14-19 Aug 1977, and then rediscovered on the other side of the Sea at Salt Creek State Beach, Riverside Co. from 20-30 Aug (where this photo was taken). Any American Oystercatcher is a very rare vagrant in California and these, inland at "the Sea," represent the only record ever recorded there. Perhaps most different in its habitat choice is the Eurasian Oystercatcher (below) which frequents flooded fields and pasturelands throughout Eurasia. This individual was foraging with Dunlin Calidris alpina in the rain on Dutch lowlands. A similiar species at the southern end of South American is the Magellanic Oystercatcher Haematopus leucopodus; nice shots of an adult and a juvenal-plumaged individual are on Greg Lasley's web site here. There is still no uniform agreement on how many species of oystercatchers there are. Sibley & Monroe (1990) and Clements (1991) lists 11 species, but I exclude the extinct Canarian Oystercatcher H. meadewaldoi (not seen since 1913) which is included by each list. 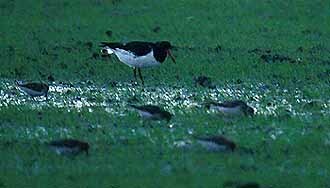 Hockey (1996) includes the South Island Oystercatcher H. finschi within the races of the Eurasian Oystercatcher H. ostralegus, but splits off the "Chatham Oystercatcher" H. (u.) chathamensis from the Variable, creating thereby an endangered species. He also gives some arguments why the Sooty Oystercatcher H. fulginosus of Australia should be split into two species (creating the "Spectacled Oystercatcher" H. opthalmicus) and why the Galapagos Is. 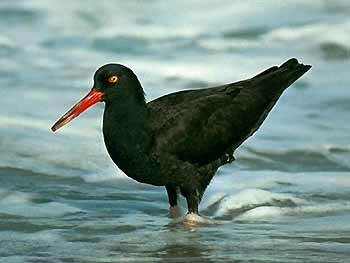 birds (galapagensis) should be separated from the American Oystercatcher. His arguments have compelling elements, and we may yet see up to 14 species of oystercatchers. Best to take care in studying each taxa one comes across. Photos: The Black Oystercatcher Haematopus bachmani in the surf was taken by Ronald L. Branson on the Monterey Peninsula in Nov 1976; the inset flight shot was at Pacific Grove, Monterey County, California, 15 Oct 1994. 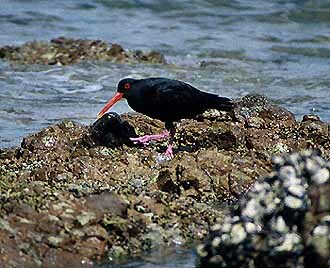 The Variable Oystercatcher H. unicolor was on Tiritiri Matangi Island, off North Is., New Zealand, 26 Dec 1997. The two American Oystercatchers H. palliatus (of 3 present) were at Salt Creek State Beach, Riverside Co., California, on 24 Aug 1977 (photo by Jeri M. Langham). The Eurasian Oystercatcher H. ostralegus was shot in the rain on Texel, the Netherlands, in Oct . Photo © D. Roberson, except those attributed to Ronald L. Branson & Jeri M. Langham, who hold those copyrights (used with permission). Hayman, Peter, John Marchant & Tony Prater. 1986. Shorebirds: An Identification Guide to the Waders of the World. Croom Helm, London. This book covers all the Charadriformes -- not just oystercatchers -- and so includes shorebirds (waders), stilts, avocets, jaçanas, thick-knees, plovers, and pratincoles. It is not a "family book" per se, since its focus is on identification problems, but it does include sections on "habits" and migratory or seasonal "movements." Breeding biology and similar topics are not covered here. However, the quality of the identification text more than makes up for this "defect", and adding broader topics would have made for a very fat book. John Marchant gets special credit for the text -- an upgrade from his 1977 guide (with Prater & Vuorinen) -- which surveys the literature well and is based on much original research. The book does rely on Hayman's paintings for illustrations and while they are generally good, I think that photos are a necessary requirement when dealing with the subtleties of shorebird identification. So use this book as an introduction to these families -- and the identification problems that exist -- but rely on other texts for state-of-the-art details. Because Hayman et al. (1986) is really aimed at field identification issues, one should supplement it with the excellent introduction to this family in Hockey (1996), which also has an outstanding set of photographs. Jehl, J. R., Jr. 1985. 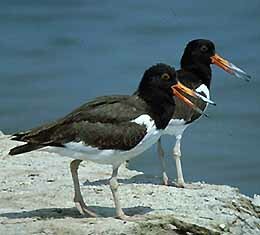 Hybridization and evolution of oystercatchers on the Pacific Coast of Baja California. Neotropical Ornithology, A.O.U. monograph 36: 484-504. Hockey, P. A. R. 1996. Family Haematopodidae (Oystercatchers). Pp. 308-325 in del Hoyo, J., Elliott, A., & Sargatal, J., eds. Handbook of the Birds of the World vol. 3. Lynx Edicions, Barcelona. Roberson, D. 1993. Fourteenth report of the California Bird Records Committee. W. Birds 24: 113-166.